With an in-depth and first-hand knowledge of the Irish property market, Richard is perhaps one of the best placed individuals to advise high-net worth investors as to maximising their potential in Ireland today. Richard has been to the fore-front of the Irish property market through the pre-boom, the boom and in to today's property market which offers significant opportunities for investors. Throughout those years, he built an impressive multi-million Euro domestic and international property portfolio, across both the commercial and residential markets, in Ireland, Europe and the United States. During that time Richard gained invaluable experience in both the private and public sector, dealing with multi nationals and government agencies, international law firms, asset and fund administrators, stockbrokers, wealth management and financial advisory services, in navigating the intricate legal, planning and financial environment ensuring maximum return. A former Army Officer, commissioned from the highly selective Military College in the Curragh, Richard understands the extraordinary power of teamwork and what can be achieved by strong leadership, honesty and mutual respect. Richard adopts hands-on multidisciplinary approach in "war-gaming" all potential scenarios when advising clients by virtue of his dealings with the major financial institutions, navigation of planning process, transaction activity, lease restructuring and negotiation. Richard is originally from Cork but now lives in Dublin with his wife and two children. He is a graduate of the National University of Ireland Galway (NUIG) and has a keen interest in business and sport. 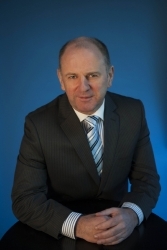 Ronan is a Graduate of the Marketing Institute of Ireland having qualified from the Institute in 1997. He has extensive experience and knowledge of the property sector and has wide ranging knowledge of general business activity. He held a Senior Manager position with Bank of Scotland and RBOS in its property Division for 10 years prior to establishing a property & finance consultancy firm called Option Finance. Ronan has gained considerable experience in a number of exciting and complex projects both at home and internationally, in markets such as Dubai, Romania, Ukraine, Poland and America. He is commercially astute and has experienced many different economic cycles given his varied jurisdictional awareness. This enables Ronan to identify sustainable investment opportunities regardless of economic positioning. Ronan possesses all the necessary levels of competency for advising and assisting those seeking to invest in commercial property. His ability to financially appraise investment viability and present opportunity in such clear and understandable manner assists the transition process for all those considering investment. His experience and aptitude for dealing with high level transactions offers a robust and comforting approach for those seeking to invest. His crafted Banking skillet coupled with his consultancy experience at the highest level has forged an enviable business acumen that can be relied upon in delivering credible and trustworthy advice. 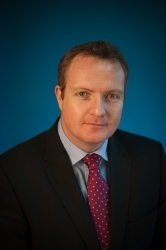 He achieved the accolade of youngest ever Senior Manager in Bank of Scotland’s commercial division and was awarded National Sales and Marketing Professional of the year in 2005 from the Marketing Institute of Ireland.